Those of you who have been following me on facebook would have already seen these beauts before and they're even more awesome in real life. I finally made time to go to town to pick these up because they sold out on-line and when I rang up my local store they said they had very few left. It is studded to perfection. I have a feeling that some of you may not love them as much as I do because we're starting to move away from all things studded but... I don't want to! It's such a practical way to add some shine/sparkle to your outfit without sequins/diamantes! I think I said that I would move away from studs a while ago, but it's an addiction I can't kick or would want to kick! To keep up to date with all of the things I have my eye on, follow me on facebook! Amazing shorts! I want them! i love them! feel like going to get myself a pair when in london next week! amazing shorts!Thanks for your comment, I follow you on bloglovin too! Thanks a lot for your comment, I follow you on bloglovin too! oh my goodness love these! I'm in serious need of a pair of studded shorts! i love these shorts! they are really hot! 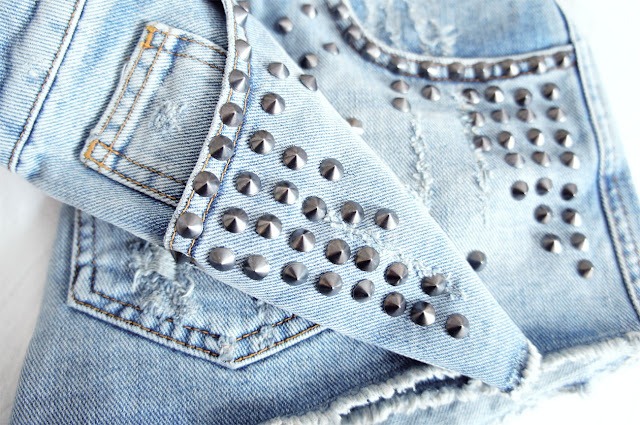 love studs! love shorts! very awesome pick! i like this jeans...maybe they're too short!! thanks for your comment and yes...let's follow each other!!! Jen! I love these pics, they're so pro!